"Turlough O'Carolan (1670-1738) was the son of a blacksmith who lived in County Meath, Ireland. He caught smallpox in 1688 which left him blind. His father's employer taught him the harp and provided him with a horse and a travelling companion so that he could travel and perform. He went on to write many beautiful melodies. In this piece I have made arangements of some of these melodies and composed musical episodes evoking wind, sea, rivers, mountains, night, and scattered these among the Carolan arrangements. I hope to give a sense of Carolan's lifestyle of constant travel." "... This is music of a profoundly contemplative nature, and as such speaks to our troubled and often chaotic times with a sense of inherent calm. Mills is honoured by excellent performances; the recording quality is first‐class." 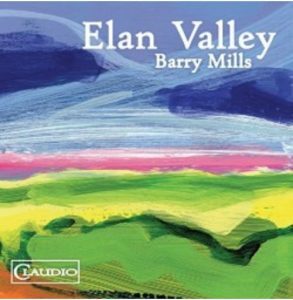 "[in] the beautiful Guitar Concerto, Mills has interwoven some of O’Carolan’s melodies with musical episodes of his own... The music is magical from start to finish, and this concerto really deserves to be discovered and played. Sam Brown is the guitarist, and he plays the piece wonderfully well. A wonderful recording!" "... Listening to these beautifully crafted works has been an easy job for this reviewer. These pieces, though clearly modern, are never raucous, and have a very tuneful quality... The soloists are expert players."